This very affordable device could easilysave a lot of lives; and it provides superb information about the o ne thing that most light aircraft panels do not show us....the Angle of Attack of our wing. Every aviator is taught and knows the critically important “Angle of Bank v. G-Force” curve. But there is not a pilot flying who has the ability to compute his constantly-changing margin above stall (a Vref, or an Optimal Alpha Angle) especially when operating with varying loads in a bank on a hot muggy day at altitude. An Alpha-sensing system can do that easily and accurately in real-time. Operationally, Alpha is critically important; accordingly, most heavier aircraft have some sort of Alpha-sensing system on board. 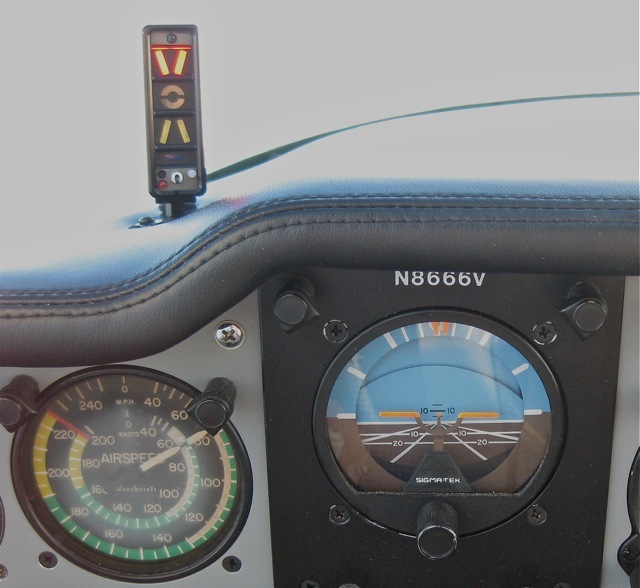 Lighter general aviation aircraft have never really had a good AoA indicator available at a reasonable cost. Now, we do; an elegantly simple device that constantly computes and displays a safe airspeed buffer. This totally trustworthy observer is always watching one thing only: my margin above stall. 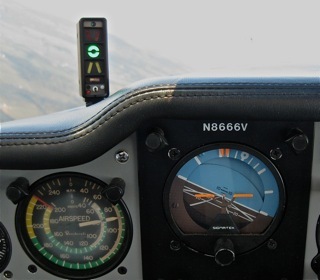 The FAA has known the importance of Angle of Attack instrumentation for decades, but -- only recently -- low cost modern electronics have become available to do the job -- affordably -- in light aircraft. In the image just above, the green (the later models are blue) donut here is showing "ON-SPEED", and in this particular S35 Bonanza, that means we are at 90 MIAS which is right at 1.3Vs. (If we had been in level flight we'd have seen a donut at ~85 MIAS, of course). That's perfect for AoA control (I do NOT mean "airspeed control") control in the airport traffic pattern all the way from downwind abeam the numbers, through the two turns to base and then to short final. I use the AoA as a reference check. 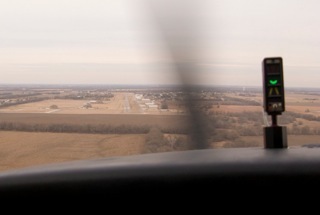 In any banked turn, I'll quickly note my AoA buffer, then switch my eyes back to airspeed for speed control. It is the ONLY instrument that tells me, for sure, that I have a stall margin remaining. Here's the Alpha Systems Angle of Attack Stall Warning System Legacy display sitting up high in front of our eyes. The newest Legacy has been enhanced by additional voice and tone alerts. This makes for a wonderfully comforting device, ESPECIALLY when our eyes are outside the cockpit and we hear a Early Warning "Deedle-Deedle" tone-only or a tone/voice combination: a "ding-dong!" and "Getting Slow" at the “Early Warning Point” (at ~1.4Vs) just as the Donut is coming alive. Not at all intrusive, it acts just like a helpful copilot should. Voice alerting? Listen to "Slow Sarah's "Getting Slow"
4. A “Deedle-Deedle” audio tone occurs once at the “Early Warning Point” and a feminine voice (“Too Slow”) repeats every ~1.5 seconds when only the red chevron is illuminated. 5. An alert tone and feminine voice ("DingDong! Getting Slow") occurs once at the “Early Warning Point” and a feminine voice (“Too Slow”) repeats every ~1.5 seconds when only the red chevron is illuminated. So....slowing a bit from 1.3 Vs, we see the "SLIGHTLY SLOW" half-donut. We are somewhere near 1.2 Vs here. ...we now see the "SLOW !! " half-donut and the red chevrons together. It means "CAREFUL, son." 1.1.Vs? Probably so. Each aircraft will differ slightly as it is calibrated. We can set as large a margin as we like. but this Bonanza has no Stall Warning Horn blowing at this AoA. It's under full control, even though it's in very slow flight...as perhaps: we might use into a very short runway. Airborne, we might want to release a bit of back pressure, but on landing in the flare, this would be a perfectly normal display...and the stall warning horn is screaming, now, of course ... as it should be. but that horn is one of the aircraft's primary data sources and this Alpha Systems Angle of Attack Stall Warning System is a secondary (if immensely trusted) device. The IAs and the FAA consider it, quite correctly, to be a minor alteration. It is totally independent of all original equipment instruments and systems....and it's very easy to install in an inspection panel. It's a real pleasure to learn about and to be able to fly this system. It is beautifully engineered. Like most great engineering products, it's really quite simple. This latest (3/2011) software incorporates some really good thinking. The alerts now fire off only when AoA is increasing. That AoA trend-sampling removes a lot of unnecessary alerts that earlier, more primitive, systems occasionally offered. We note with real pleasure that every concern we expressed in the test flight report has now been addressed as a product improvement. What will an AoA Display NOT do? I am frequently asked "How much better will my aircraft perform with a AoA installed?" ... an AoA will enable a pilot to extract all--or, at least: far more of--the airplane's available performance. An AoA can definitely make a good pilot better and enable him to fly more precisely." Here's some more video that was taken while we flew the plan. Feel free to look over our shoulders. As you do, please recall that an AoA device really comes into its own when we are steeply banked...because our airspeed indicators become less trustworthy as the air-loads on the wing increase. Installation is a minor alteration -- on the vast majority of light general aviation aircraft. The Alpha Systems Angle of Attack (AoA) Stall Warning System offers an accurate, repeatable, and very early warning of impending aerodynamic stall. 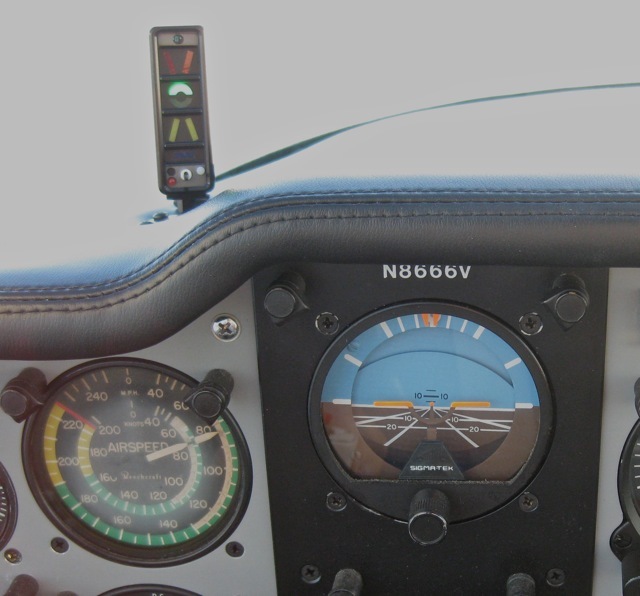 Such clear stall proximity information mounted prominently on the glareshield in full view of the pilot offers enhanced safety in the operation of general aviation aircraft. 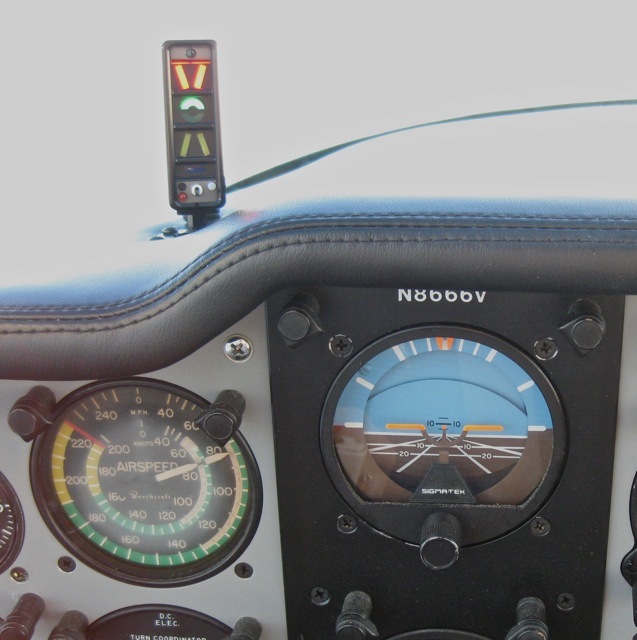 A display of AoA as a cross-check to the primary Airspeed Indicator is particularly useful when operating in steeply banked and/or G-loaded flight conditions because the angle of attack at aerodynamic stall is independent of aircraft weight and/or wing loading. •	The “Optimum Alpha Angle (OAA) Calibration” technique recommended by the Alpha Systems AoA Stall Warning System Installation Manual is an accurate and repeatable method that can be used to reliably set an AoA target that will be adequately before the aerodynamic stall AoA. •	The target AoA, once calibrated, presents data to the pilot so as to provide early warning of an impending stall, prior to the aircraft stall warning audible system, thereby ensuring a safe margin above stall throughout the entire gross weight envelope. •	The instrumentation provides clear, un-ambiguous, and easy-to-comprehend stall proximity information. OTHER VOICES: Read comments from pilots with recent fight experience using this particular AoA device, with AoA flight time in military aircraft, and in using AoA devices in general aviation aircraft. Read what a few Flight Instructors and Pilot Examiners think about it. As you read along, please notice that all are pilots with great experience...the most highly skilled among us...and ... EVERY ONE of them is savvy enough and humble enough to know that there are VERY GOOD REASONS for having an Angle of Attack indicator on the glareshield. Read also the recent articles in the aviation press. Here is a list of all the AoA manufacturers that I'm aware of. I have NO financial interest in this company or its products. NONE, now or ever.